In an increasingly digital world, health-care organizations are recognizing the potential of eHealth to improve the flow of information among health professionals to support the delivery of health services and the management of health systems. By implementing eHealth solutions, organizations can enhance the quality and safety of the care and services received by persons accessing the health system. 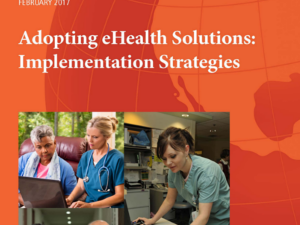 The Adopting eHealth solutions: Implementation strategies guideline was developed in partnership with Canada Health Infoway as a key resource to assist health-care executives, nurses and other health professionals effectively lead and support the implementation and adoption of eHealth solutions across the globe. highlight key resources and tools. Achieving Care Excellence Consulting Service Inc.